By the early nineteenth century, imitation of the classical was the rage in Europe, in architecture as well as fashion. Ladies’ gowns became simpler, with low necklines and ribbons tied beneath the bust, usually white due to a mistaken belief that the white marble statues being excavated in Greece were the original color. (They weren’t; the original brightly-colored paint had worn off.) Napoleon preferred ladies in white, and even though Britain and France were at war during this time, French fashions were all the rage. Thin fabrics were de rigueur, muslin being the most popular, followed by silks and satins. 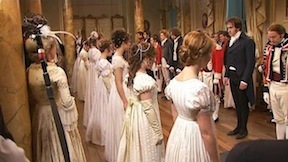 As the new century progressed into the Regency and beyond, ladies’ gowns became more ornate, with another gown worn over the classical one, either a shorter length or with the front panels open to reveal the under-dress. Trims became more and more ornate, with ribbons, bows, and furbelows everywhere; collars of Elizabethan lace took the stage. 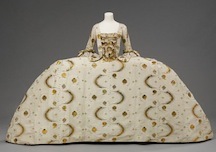 By 1815, colored and grander fabrics were back. Even in the dead of winter, many ladies would rather shiver in their flimsy gowns than be so unfashionable as to wear a heavy wrap. However, they did have shawls—Kashmir shawls had the advantage of being both light and warm—and various types of coats and jackets. 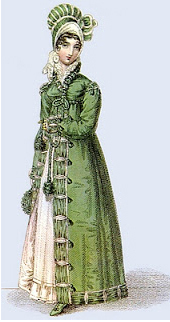 A pelisse was an elegant overdress with long sleeves that buttoned down the front. A mantle was a rectangular fabric gathered at the neck. A spencer was simply a short jacket that reached the waist of the gown. Cloaks were often lined and/or trimmed with fur. Lizzie wears a spencer over her dress. 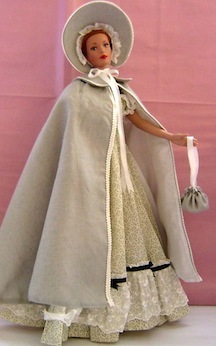 The lady wears a mantle and carries a reticule. For the most part, shoes in this period were “straights,” meaning there was no left or right shoe. Pumps made of embellished kid called slippers were very popular. Ladies had half-boots for walking, and stout boots for cold weather might be fur-lined. White silk hose tied at the knee (or later, the thigh) were often decorated with flowers or bowknots. Under-drawers were not widely worn until after the Regency, around 1820. 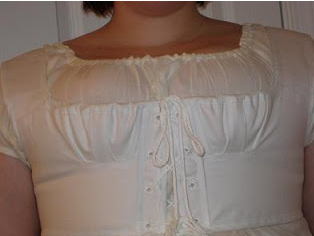 Short corsets with shaped cups for the breasts were common, although longer corsets were available to assist those with problem figures. A petticoat called a chemise was worn under the gown. 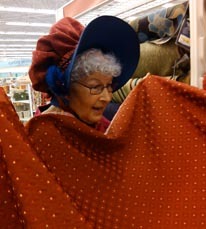 Smaller, simpler bonnets gradually became more ornate, constructed with straw, velvet, satin, and crepe, trimmed with ribbons, ostrich plumes, and fabrics. 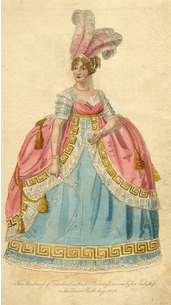 Decorated caps (undress bonnets) of lace or satin were worn indoors and outdoors in informal settings. 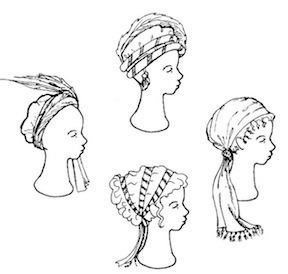 Turbans of various styles were popular for full-dress occasions. 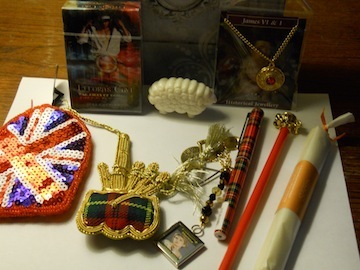 A fashionable lady had ribbons, jewels, combs, plumes, and hairpieces to dress up her hair for elegant evenings. Gone was the “big hair” of the previous century that towered so high that once a lady’s hair caught fire from the chandelier (Georgiana, Duchess of Devonshire). Classical hairstyles to match the classical gowns were “in”, and short, cropped hair, à la Titus, was popular through 1810. 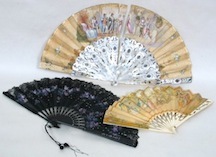 Fans made of ivory with silk, gauze, or lace were another important accessory for every occasion. Every young lady learned the “language of the fan” in order to convey social messages without having to be rude. There were different fans for different occasions, and some were jeweled and hand-painted. As for jewelry, simple gold crosses expanded to jeweled necklaces, bracelets, tiaras, and even elaborate clasps on shawls and wraps. 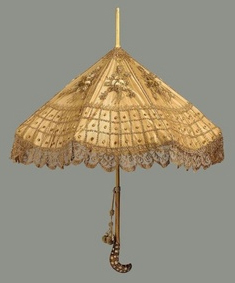 Silk parasols, often decorated with fringe, were required during outdoor activities in order to prevent the development of freckles. A reticule, or ridicule, was a small bag often made with fabric from a gown used for carrying coins and items formerly carried in pockets. A lady’s maid or abigail was necessary for such things as caring for clothing, preparing baths, dressing (gowns usually fastened in the back), and doing hair. She also accompanied her mistress while shopping and walking; young, unmarried ladies were not allowed out without chaperones, at least not while in the city. One of my favorite scenes in Regency stories is when the ladies go shopping. After having my own Regency gown and pelisse made for me this year (by my own very talented mother), I wasn’t all that keen on the frequent fittings. And not being able to get in and out of my gown without assistance. But I LOVE feeling like a princess when I wear it! Of course, having a gown made this way is a great deal more complicated—and expensive—than buying one in a department store. But then, the dress you end up with is uniquely yours by the time you add the trim and embellishments—you’re not likely to ever see anyone else wearing it. Would you ever consider having a period gown made up like this? Where would you wear it? 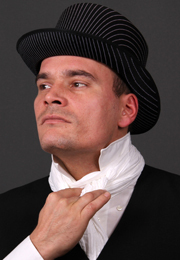 Click here to see photos of my Regency outfit. The Regency Companion, Sharon Laudermilk and Theresa L. Hamlin, Garland Publishing, Inc., 1989, pp. 30-48. Almack’s was founded in 1765 by a Mr. McCall. The building was located on King Street just off St. James Street* and included a large ballroom, as well as supper rooms and card rooms. Almack’s was ruled by a select committee of society matrons known as the Lady Patronesses. These ladies ruled the club with an iron hand; only the crème de la crème (about 25%) of London society were authorized to cross the threshold of this exclusive circle. Each application for membership was carefully scrutinized by the high-handed patronesses, who were not above using their power for retribution against their rivals or other personal reasons. The food served was not of the best quality. Alcohol was not served—only tea and lemonade.The floor of the ballroom was said to be dreadful, and the rigid rules set by the patronesses could not be broken by anyone. It is said that the Duke of Wellington, the hero of the Peninsular War, was refused admission because he did not sport the proper dress—knee breeches, white neckcloth, and a long-tailed coat. The doors were locked precisely at eleven o’clock and no one was allowed in after that for any reason. There was a long list of”do’s” and “don’ts” (mostly don’ts) for the young debutantes, and any infraction could result in expulsion from the club and social censure. When the waltz was finally given the seal of approval—it was condemned for years as being scandalous due to the close proximity of the dancers’ bodies—the young ladies had to be individually approved to dance it by one of the patronesses. Almack’s balls were decidedly not anywhere near the grandest balls of the London Season, so why did the matchmaking mothers of the haut ton scramble to get their hands on those square cardboard vouchers that would gain them admittance? One word—marriage. Almack’s was the exclusive “marriage mart” of the ton. While potential spouses for your sons and daughters could be found elsewhere, the “best” ones could ideally be found at Almack’s, where the average, everyday riffraff need not apply. Who wouldn’t want their daughter to find a wealthy, well-connected—perhaps titled—spouse to enrich the family fortunes? Matchmaking mothers everywhere yearned to have their marriageable offspring included among the exclusive company of Almack’s. Lady Castlereagh (Emily Anne) was a wealthy earl’s daughter who married the Viscount Castlereagh (later the 2nd Marquess of Londonderry), who held many political posts (Secretary of States for War, Secretary of State for Foreign Affairs, and leader of the House of Commons) during the period. Lady Castlereagh was the one who insisted that the door to Almack’s be closed promptly at eleven. 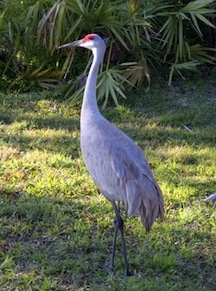 She and Mrs. Drummond Burrell were both known for their disdainful arrogance. Lady Jersey, “Queen Sarah,” “Silence,” or “Sally” to her close friends was the wealthy daughter of the 10th Earl of Westmoreland who married the 5th Earl of Jersey. Lady Jersey’s mother-in-law, Lady Frances Jersey, was at one time the mistress of the Prince of Wales (it was she who recommended he choose Princess Caroline for his wife), and her parents eloped to Gretna Green (quite the scandal). 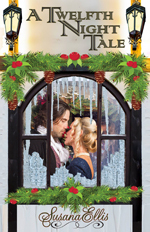 Lady Jersey’s younger sister married the brother of the scandalous Lady Caroline Lamb, but when the latter ridiculed her in her vengeful novel Glenarvon, Lady Jersey barred her from Almack’s forever. 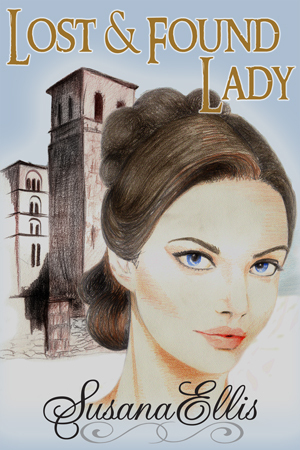 Lady Sefton (Maria) assisted many a green girl to negotiate the hazards of the marriage mart. Her husband was an enthusiastic sporting man, and a member of the Four-in-Hand Club (an elite club for only the best drivers). Lady Cowper (Emily) was the daughter of the great political hostess, Lady Melbourne, and due to her mother’s numerous affairs, her paternity was never verified. She disapproved of her sister-in-law, Lady Caroline Lamb, but was otherwise known as one of the kindest of the patronesses. 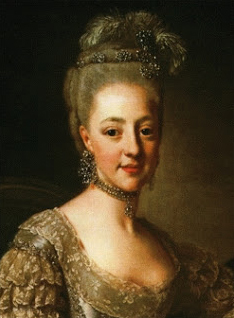 Princess Esterhazy (Thérèse) was the grand niece of Queen Charlotte and never let anyone forget it. Her husband Prince Paul Esterhazy served as the Austrian ambassador to England 1815-1842. She and the Countess Lieven demonstrated the utmost in continental sophistication. Countess Lieven (Dorothea) was the first foreigner to serve as a patroness of Almack’s. Her husband the Count was the Russian ambassador to England from 1812 to 1834. Besides being a leader of London society, she was a significant political force in Great Britain, France and Russia. Mrs. Drummond Burrell (Clementina) was a great heiress and daughter of an earl who later became a baroness when her husband succeeded to his father’s title. Although one of the younger patronesses, she was considered the most arrogant and haughty of them all. It’s interesting to note that while London society, as demonstrated by the Lady Patronesses, demanded a high degree of moral perfection, it was really the façade that counted. As long as you behaved with discretion—i.e., didn’t get caught—you could have adulterous affairs with impunity. While it was expected that wives would remain faithful to their husbands until the birth of an heir or two, after that, it was quite common for both husband and wife to indulge in affairs. It was widely known that Lady Melbourne had affairs with politically powerful men who fathered many of her children, but her the importance of her position precluded any open censure. 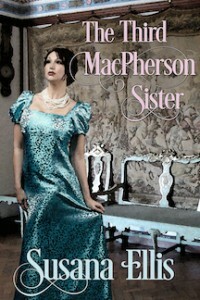 Most of the Lady Patronesses of Almack’s had notorious affairs. Emily Cowper, taking the advice of her mother, the above-mentioned Lady Melbourne, to be true to her lover rather than her husband, had a long affair with Lord Palmerston, who later became Prime Minister, and after her husband died, they married and lived happily ever after. As long as it was behind closed doors—and you were wealthy and important enough—you could get away with a considerably lower standard of behavior. Of course, marriages tended to be more about property, wealth and family connections than any sort of love or affection, so perhaps such scenarios were a natural result of cold-blooded unions. The King Street location of Almack’s is an office building now; when I was there two weeks ago, it was covered with scaffolding. Christie’s Auction House is across the street. 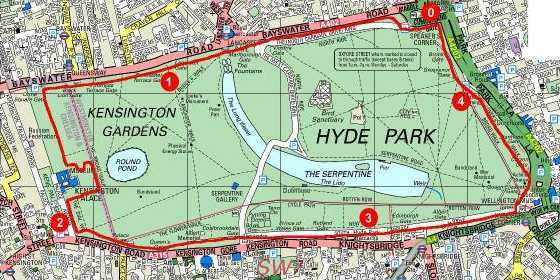 owning or renting a suitable residence in a fashionable area of London (in addition to a great country home on their estate), along with the requisite servants, stables, etc. 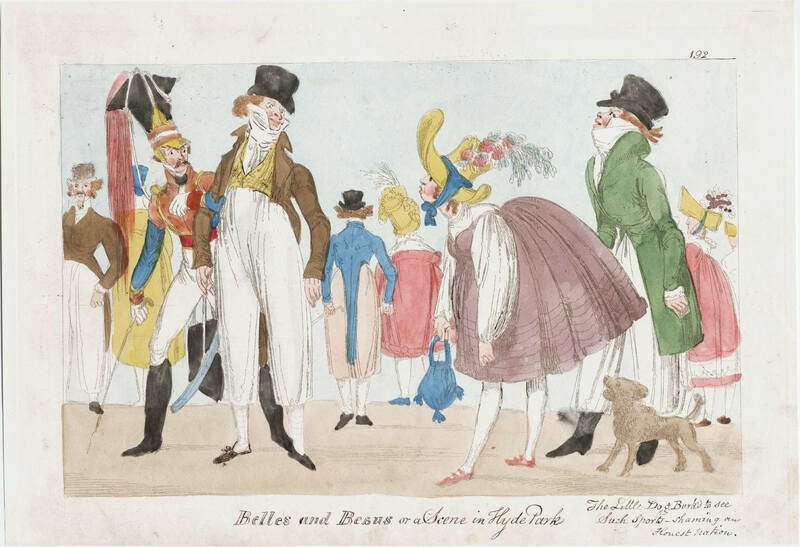 costs of renting theatre boxes, purchasing entrance tickets to public entertainments, such as the Vauxhall Pleasure Gardens, Astley’s Amphitheatre, etc. allowance or pin money for wives, sons or daughters. What was the London Season? The London Season evolved from the legislative sessions of Parliament, which would run roughly from January/February to June. Generally, a peer would bring his family to London sometime after the holidays, which provided a perfect opportunity for their families to socialize and seek suitable spouses for their children. 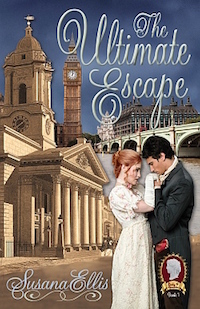 The Season didn’t heat up until spring, though, and by the end of June, most of the first families escaped the odiferous heat of London for the fresh air of their country estates or perhaps a seaside resort. 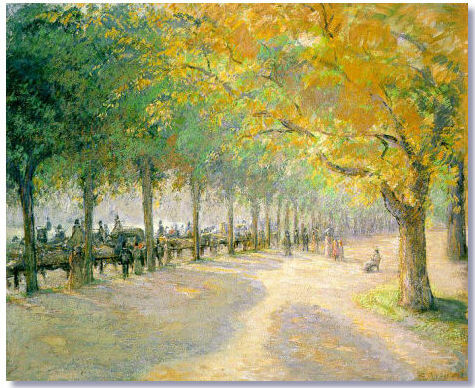 Many families would return to London in September for the “Little Season,” which was much less prestigious, but few were left in Town by the end of November. Essentially, anyone who was anyone would participate in the London Season, even if they had to run up enormous debts to do it. In Treasuring Theresa, an earl’s daughter such as Lady Theresa would be expected to have a London Season and make a suitable marriage. 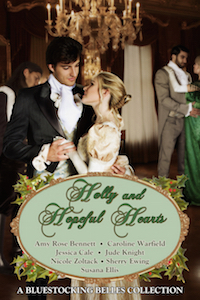 Unfortunately, however, her first Season was unsuccessful, and later, there was no money for it, so when childhood sweetheart Reese Bromfield broke her heart by betrothing himself to another, Lady Theresa’s options for marriage were limited. Incidentally, Reese Bromfield, as the son of a squire, was not highly-connected, but as the son of a wealthy member of the gentry, he would have been welcomed to participate in the ton, although not, perhaps, in the highest circles. What did people do in the London Season? London offered—and still does to this day—an endless number of delights for visitors, regardless of status. 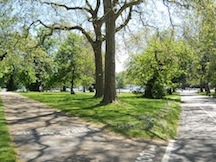 In the early 19th century, one could walk or ride through the park (Hyde Park or Green Park were quite popular), visit the British Museum or any number of museums or galleries, attend a circus performance at Astley’s Amphitheatre, visit the Pleasure Gardens of Vauxhall with its nightly fireworks, and attend the theatre or opera. 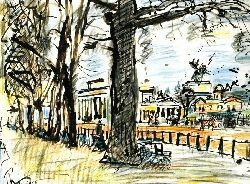 The best shopping in the world could be had on Bond Street, and for the gentlemen there was racing, boxing, gaming, and all sorts of attractions that couldn’t be found on a remote country estate. For the haut ton, there were balls and parties, soirées, routs, musical evenings, Venetian breakfasts, al fresco teas, extravagant dinners…all sorts of opportunities to hobnob with wealthy aristocrats and politicians and make connections that could potentially lead to even higher status and prestige. What did people do the rest of the year? Whatever they wished! Many spent the summer on their country estates, which generally sported expansive mansions with huge ballrooms that could be used for house parties, during which they would entertain their friends from other parts of England for a week or more. Sometimes gentlemen took a personal interest in their estates, but often the management was left to a steward or estate manager so that the owner was free to participate in local society, or travel to the seaside, or take the waters at a spa resort, such as Bath. Hunting and fishing were popular sports for the gentlemen. In Treasuring Theresa, Damian Ashby was a society dandy who despised the country, except for the income it provided him. Lady Theresa despised the superficiality of the ton and preferred life on her country estate, where she counted among her friends villagers and commoners, as well as the local gentry. How will these two seemingly complete opposites manage to bear each other’s company for an extended period of time as her dying father wishes? 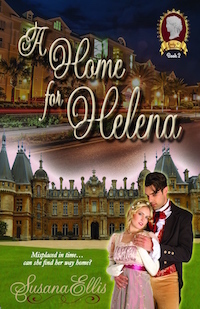 Still, she’s the daughter of an earl, and he’s the heir to her father’s title and estate, so they are destined to spend more time in each other’s company…sooner rather than later. And who knew that the two of them would develop an unlikely attraction to one another? Note: Excerpts and additional reads—including an epilogue to this story—are available here.